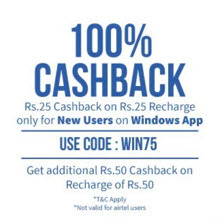 Only for new Freechrge Window app users Freecharge offering get Rs.50 cashback on Rs.50 recharge + Rs. 25 Cashback on Rs. 25.